A lively, peaceful protest was held outside the St Mungo's Broadway board meeting yesterday evening at Griffin House in Hammersmith. This was the meeting where the Executive Team took their proposals to reduce staff pay plus other changes to the Board of Trustees for approval. Chants of "Front line workers on 20k - low pay, no way!" and speeches from Adam lambert and Jon Hughes went down well with protesters, staff from the building and membrs of the public. Hundreds of leaflets were handed out to local people and businesses explaining the reason for our dispute. Even the security guards at Griffin House were sympathetic! However, there was no sign of any members of the Executive Team or of the Board, it appeared that they preferred to make their decisions behind closed doors. 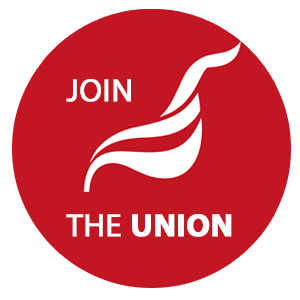 In the past St Mungos boards held regular meetings with Unite in order to understand the concerns of their staff. Today staff are left outside on the street. The protest coincided with an article in Inside Housing magazine reporting a Vote of No Confidence in Howard Sinclair by union members in St. Mungo's Broadway. The article also reported that ballot papers for industrial action were sent out to union members yesterday.